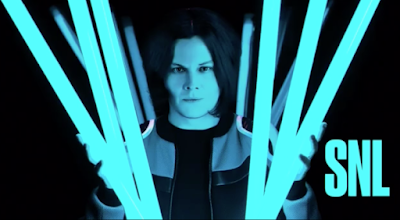 Jack White performed a pair of tracks from his new album, “Boarding House Reach”, on the April 14 episode of NBC-TV’s Saturday Night Live, and video from the program is streaming online. Hosted by comedian and former SNL writer John Mulaney, the singer also appeared in an unaired "Cut For Time" sketch as a wedding band guitarist in a video released by the late night series. White’s appearance comes just days before he launches a spring tour of North America in his hometown of Detroit, MI on April 19.